Tired of Vim? Here's tips for C++ development in Xcode. Tuned to the needs of many classes at UM. Sidenote: ./project1 arg1 arg2 arg3 < infile.txt Here, infile.txt is NOT a command line argument visible to the program. It is a redirection to stdin, and is discussed in the next section. 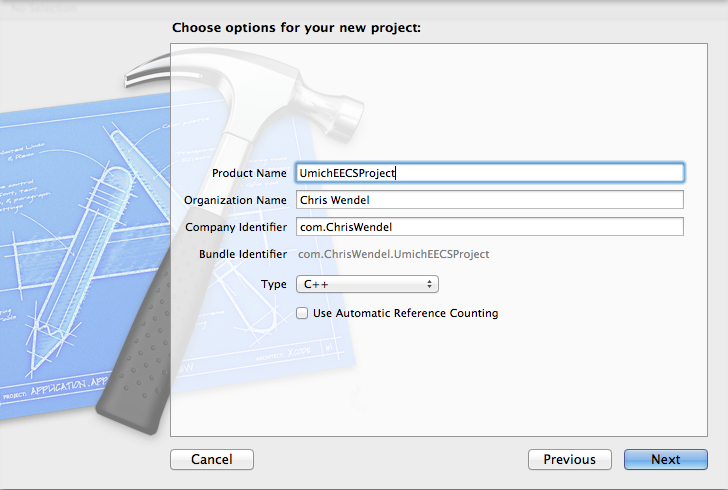 ...or click on the project name right next to the Run button. Add whatever arguments you need in the 'Arguments Passed on Launch' box, and click Okay. In this case, we add arg1, arg2 and arg3. Voila! You will now have these three arguments acessible to you as argv, 2 and 3. Now cin will behave the same as if you redirected the contents of a text file to a program, as seen above. If you do not specify the MYARQ environment variable, then it will instead read from cin as normal. The first option is to place the file(s) into the products directory where the excecutable is. Right click on the products directory and click 'Show in Finder'. 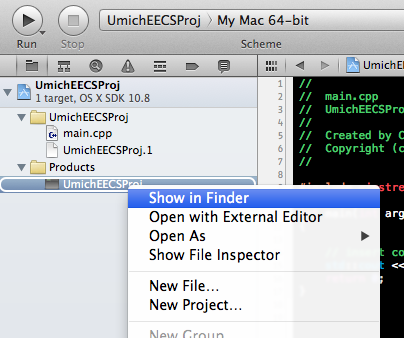 Put your input files in there, and find your output files there after running. 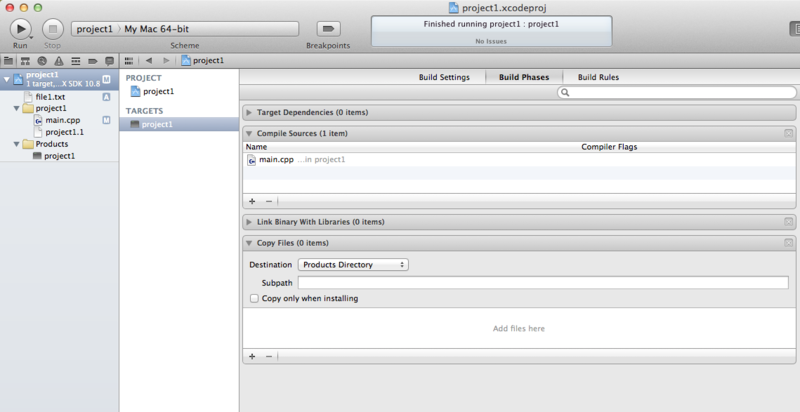 Another option is to create the input files right within Xcode and then modify 'Copy Files' in the Build Phase. This is a more complicated one-time setup, but will then allow you to edit the input file right within Xcode. 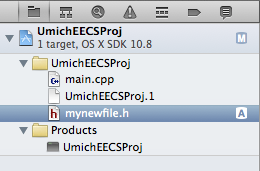 First, create a new empty file in Xcode via File->New->File (or skip this and drag a file into Xcode). Add your input file to the 'Copy Files' section. Make sure that 'Products Directory' is the Destination, subpath is empty, and 'Copy only when installing' is unchecked. You may see project1.1 as a copy file. Feel free to remove that. You're all set. 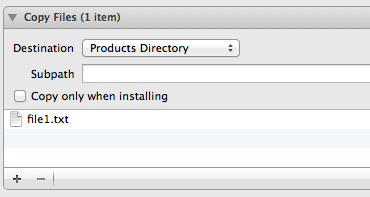 Modify the input file in Xcode, and it will copy it into the products directory when you Run. The output file will be in the products directory like in Option 1. 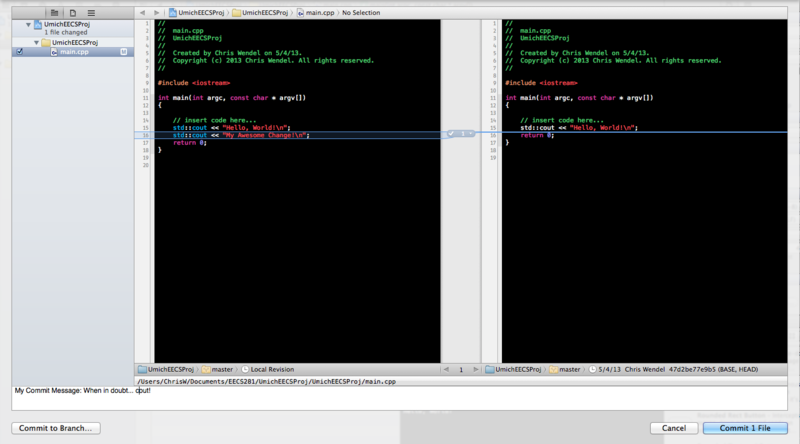 Debugging is pretty awesome in Xcode, and will save you a lot of headache versus using GDB via the command line. To place a breakpoint at a line, click the area immediately to the left of that line of code. 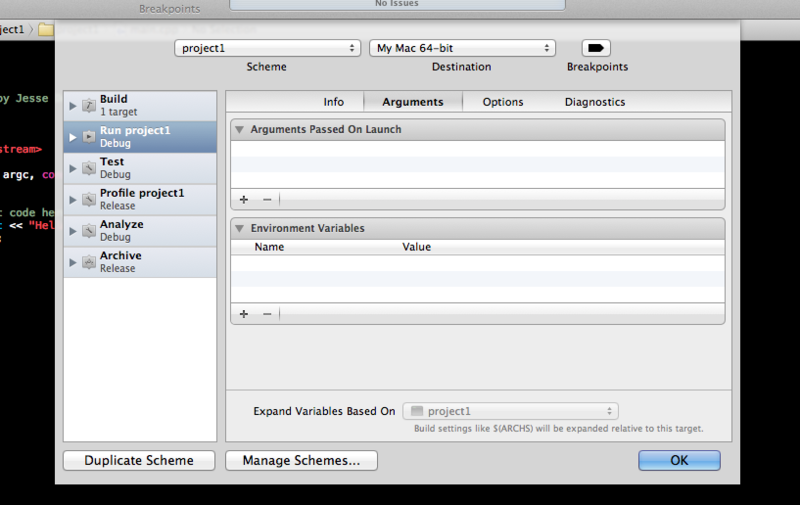 To enable breakpoints, make sure the 'Breakpoints' button on the top Xcode toolbar is turned on. It will automatically turn on when you set your first breakpoint. In the Navigator on the left, there is also a Breakpoints tab. Here, you can see all of your breakpoints by file, and modify & delete the breakpoints. 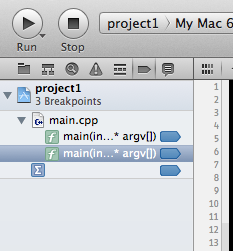 With this tab selected, the '+' in the bottom left corner of Xcode will allow you to add breakpoints as well. Turning on exception breakpoints can be useful as it occasionally will bring you to the cause of a seg fault. When your project hits a breakpoint, you will be presented with the debug window. Here, you have a snapshot of active variables, and the usual options to 'Continue,' 'Step over,' 'Step Into' and 'Step Out.' If you don't see the debug window, you may have the console expanded too much, so click the button right above the right side of the console. Let's say we want to commit this change, we can do this two ways. The first being through the GUI of Xcode. 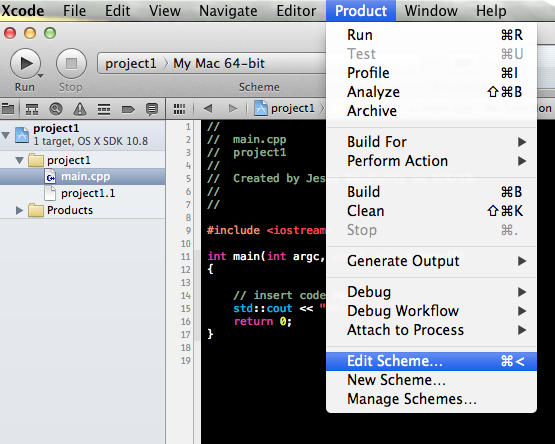 First, right click on the modified file, and then select Source Control->Commit Selected Files. You can also do this through using the command line: Make a change to a file in your project, it will show up as Modified in Xcode, then on the command line, go to the path of your project. If you type git status you should see that the file you changed is listed as modified. 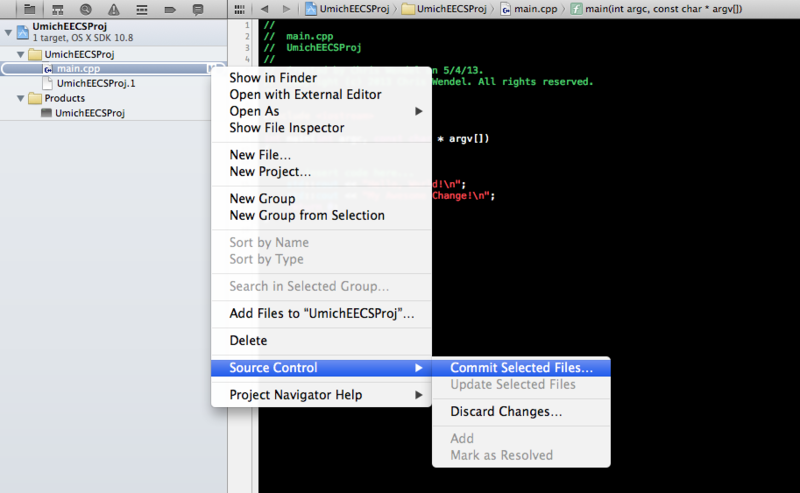 To add files to your git repo, in Xcode, add a new file simply with File->New File. An 'A' should show up next to your new file, showing it has been added since the last commit. To commit through Xcode use the same steps from above: Right click file->Source Control->Commit Selected Files, and then write your commit message and commit. To add a file to your git repo on the command line, simply type git add mynewfile.h and then when you type git status the newly added file should show up as added. Then simply write, as seen above, git commit -am "My commit message: Commiting my new file" and your newly added file will be commited. Development is awesome in Xcode, but you should be sure to consistently test your code in CAEN, since that is typically the enviroment where your code will be graded. We've used a couple different methods to share code easily between your Mac and CAEN. The first method is setting up a git repo on either CAEN or Github (or others like Bitbucket), and cloning the same repo on your CAEN. This isn't a git tutorial, so look other places for more help with that. Then you can just push from your mac and pull from CAEN whenever you want to test. 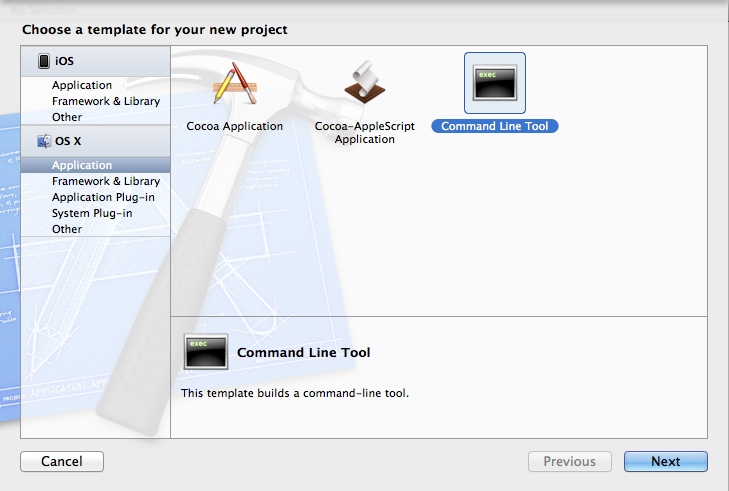 Xcode will automatically compile with C++11. If you need C++11, Add the -std=c++0x flag when compiling on CAEN, or check that it is in your Makefile. Xcode automatically includes some files. Explicitly #include any libraries or files you need. Pseudo-random number generation. If your project ever has you using srand(CONSTANT), which we've seen in EECS 281, you WILL see a difference between the 'random' numbers generated on OS X and CAEN. If you are seeding based on time do not worry about this. 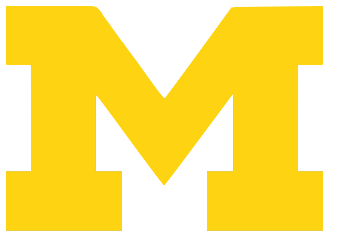 We hope this guide will help you with some of your C++ projects at Michigan. If you have any other tips for us to add, or if you or need clarification on something, feel free to email Jesse or Chris. A cleaner solution for handling command line arguments. Setting up private git repos on CAEN. Debating whether to take EECS 381?